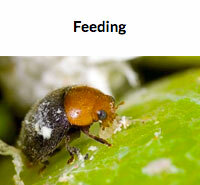 These small beetles attack all species of mealybugs and will also feed on aphids and soft scale. The mealybug predator, better known as Cryptolaemus montrouzieri, was originally brought to America from Australia over 100 years ago by Albert Koebele, an early champion of biological controls. Used to help control an outbreak of the the citrus mealybug — mission accomplished! — these small lady beetles are deadly as adults and larvae to aphids and soft scale insects as well as mealybugs. 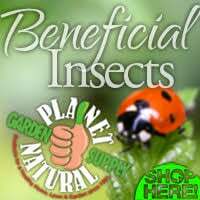 Shop our large selection of biological controls, including mealybug predators, at Planet Natural. One vial — 100 “crypts” — treats up to 50 plants and costs $84.95 with FedEx Overnight shipping included! Mostly black with a tan front, the adult Cryptolaemus searches out the waxy, sometimes cotton-like egg cases of its prey. It then lays its own eggs nearby. 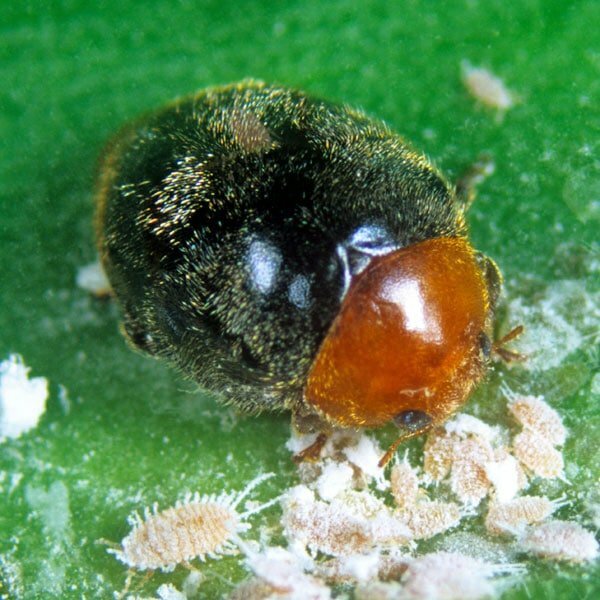 The larvae emerge within five days and begin to feed on the eggs as well as the young crawler stage and the pest’s honeydew . 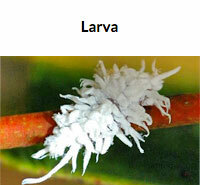 After three larval stages, the mealy bug larvae enter the pupal stage before becoming egg-laying adults. The process takes approximately three weeks. Adult females will lay some 400 eggs over their two month life span. 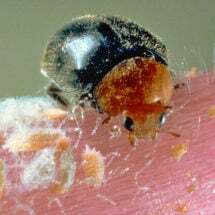 While this predatory beetle thrives on high mealybug populations, they are best released in early spring when the first pests are observed. The predatory beetles are most active at 70°F or higher and should be released at a rate of 0.5 per square foot of planted area, or 2-5 beetles per infested plant. 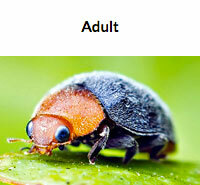 In orchards, release 1,000-2,000 adult beetles per acre of mature fruit trees. Adult beetles are shipped in vials mixed with paper strips to provide protection. Water the area to be protected and gently shake the contents evenly over, or near, the pest problem. Repeat as necessary, usually once or twice per year. Note: Often after release, the mealybug problem appears to be worsening before it improves. This is because C. montrouzieri larvae are covered in a white, woolly material and are very similar in appearance to their prey. Tip: Ants feed on the honeydew that sucking insects (aphids, mealybugs, thrips) produce and will vigorously protect these pests from their natural enemies. If possible, control ants prior to release.